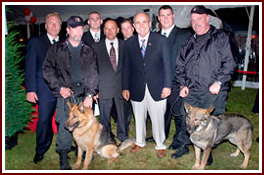 Long Island K-9 provides canine Services for corporate security, celebrity events, executive protection, dignitary protection, mass gathering events, sports and entertainment venues. We provide Explosive Detection Teams to detect explosives and Narcotic Detection Teams to detect narcotics. We also provide canine services to schools, offices, stadiums, ports, airports, and anywhere canine services are required. Long Island K-9 has Explosive/Narcotic detection handler courses for qualified applicants starting in September 2010. We still have five openings for detection handlers. This is chance of a lifetime and can generate unlimited income for serious applicants who love to work with canines. Just click on the contact us page and leave us your contact information. Long Island K-9 introduces all new one on one canine obedience sessions. For more information, click on the contact us page and leave us your contact information. Long Island K-9 was featured in Newsday on June 3, 2011. If you see German shepherds, a Belgian Malinois or a Labrador retriever sniffing around your car on one of the ferry boats owned by the Bridgeport & Port Jefferson Steamboat Co., relax. They are on your side. Under a U.S. Homeland Security grant, the company has hired Manorville-based Long Island K-9 Service to provide dogs that are trained to sniff out explosives aboard the boats. Fred Hall, the ferry company's vice president and general manager, said the three-year grant totals about $300,000. According to a company statement, the ferry is the first in the country to receive a federal grant to hire an explosive detection canine team, but Homeland Security officials were unable immediately to verify that. Hall declined to say how often or when the dogs would be used, citing security reasons. James Greco, 57, owner of Long Island K-9 Service and another company, Long Island Security Consultants, said he has 11 dogs -- seven shepherds, two Malinois, and two black Labs. The company has 20 employees, all with law-enforcement backgrounds. He started Long Island K-9 Service company about 15 years ago but has been training dogs most of his life. "I feel very close with animals," said Greco, who has two Malinois and a black Lab at home. His wife, Nicole Greco, and their two children, who are 4 and 6, are all dog lovers. Greco's dog company has grown, going from only a few thousand dollars in sales over a decade ago to an expected $100,000 this year. He won a contract in 2004 to provide K-9 bomb-sniffing services at the 2004 Republican National Convention in Manhattan. "I have a passion for this," Greco said. Long Island K-9 teams can, in a few hours, scan your entire facility for the odor of explosives, weapons, or narcotics. Companies and schools of all types, which are concerned about contraband making their way into the workplace or on campus, all over the world, are employing Canine Detection Teams. We provide Canine Detection Teams to, manufacturing facilities, transportation companies, public and private schools, service firms with vehicle fleets, airlines, and airports. Companies are turning to Canine Detection Teams to provide an effective deterrent to illegal behavior. It is consistently faster, more cost effective, low tech alternative to expensive modern machinery that often breaks down. Canine detection provides almost no disruption to the workplace whatsoever. Long Island K-9 Service Detection Teams are credentialed and certified as a Team using the guidelines of the United States Police Canine Association (USPCA) standards. These teams are also attending annual testing and on-going continuous basis. Each canine Team is trained for detection service and is not attack, patrol, or handler protection trained. They are trained to give a passive (sit) or aggressive (scratch) response when they detect the odor they have been trained to alert on. Meaning, the canine simply sits or scratches next to the article or item to indicate they have found an odor that they were trained to alert on. Although the canines are considered “working dogs” they are all very friendly, love attention, and interact with people with absolutely no aggression whatsoever. They tend to be very energetic and fun to watch working, as well. They are trained using a positive reward system and are well cared for and always maintain a very healthy happy lifestyle. 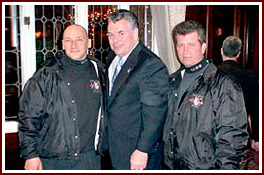 Founder of Long Island K-9 Service, Officer James Greco (on the left) conducting an explosives sweep for the Chairman of Homeland Security US Congressman Peter T. King. Founder of Long Island Security Consultants James Greco, pictured on the right of Christie Brinkley, with the LISC security staff, providing security for that evening's event.